The 5F series of subminiature slide switches from Dailywell are single or double pole, double throw switches with slide action and a choice of switch functions. Electrically rated to 3A at 120VAC/28VDC or 1A at 250VAC in silver or gold over silver contacts or 0.4VA max at 20VAC/DC in gold contacts and a mechanical life of 30,000 cycles. The 5F series of subminiature slide switches from Dailywell are single or double pole, double throw switches with slide action and a choice of switch functions. Electrically rated to 3A at 120VAC/28VDC or 1A at 250VAC in silver or gold over silver contacts or 0.4VA max at 20VAC/DC in gold contacts and a mechanical life of 30,000 cycles. Available in surface mount (SMT), wire wrapped and straight or 90° PC pin termination styles designed for manual or wave soldering processes the 5F series also has a choice of 3.1mm or 5mm high actuators. 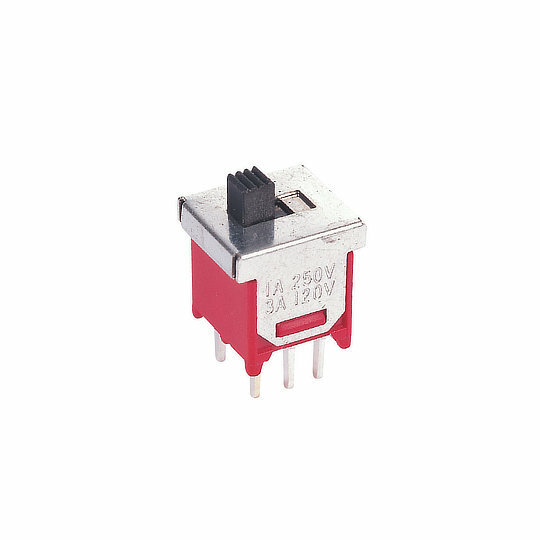 The 5F series are perfect for applications such as Home Appliances, Computer Peripherals, Industrial Control Systems, instrumentation and Audio-Video Equipment.